The pieces to be examined below were on display at Bury Art Museum between 27th August – 19th November 2016 as part of the Reading as Art exhibition curated by Simon Morris. Bury Art Museum is an imposing Neo-Georgian structure at the end of a Manchester tram line. It evokes all the nostalgia and vigour we associate with the turn of the century, wearing its gilt-letter, purpose-built, proudly placed stone: ‘Art Gallery’. What impressions does this faded grandeur form? What do these impressions amount to, with all their connotations? How do we sift through the recognitions and connections that bloom in the mind, in order to carry what’s relevant through the front door? Here, on the fringes of the purpose of our visit – before we enter the vestibule and cross the gallery’s threshold, are we already dealing with the ‘paratextual’? We intend to see the current exhibition, Reading as Art (for the time being our ‘text’), curated by Simon Morris (for the time being our ‘author’). Do the primary impressions outlined above ‘ensure for the text a destiny consistent with the author’s purpose’? This, Gérard Genette would ask. Possibly – the answers are too evasive to attempt here. Yet, for Genette, the answer to the question ‘are they paratexts?’ would be an all-resounding ‘no’. Among the first theorists to pursue any in-depth study of ‘those liminal devices […] that form part of the complex mediation between book, author, publisher, and reader’ (or, in our case, the impressions formed on approach to the gallery) Genette’s Paratexts is an encyclopaedic break down of the various elements that work to present a text to its possible readers. These range from a book’s cover, title and blurb to forwards and epigraphs and further still to interviews with the author, newspaper reviews and other publicity paraphernalia. As we can see, whether or not these things actually belong to the text is irrelevant, so long as they function in some manner to ‘to ensure the text’s presence in the world, its “reception” and consumption in the form (nowadays, at least) of a book’. It is becoming clear that we are moving beyond the boundaries of what Genette himself deems paratextual, in supplanting book with gallery show. Through his assertion that ‘the paratext is itself a text: if it is still not the text, it is already some text’, it would be safe to assume that our first impressions of the exterior to Bury Art Museum would not fall within his remit. To aid clarification, the show’s title definitely fits Genette’s definition of the paratextual: it is linguistic in substance; it is subordinate in hierarchy, being ‘fundamentally heteronomous, auxiliary, and dedicated to the service of something other than itself […] This something is the text’; and it is obviously attributable to Simon Morris: ‘the author or one of his associates accepts responsibility for it’. While Reading as Art may not be the title to a book, it is a title nonetheless, and it’s not difficult to see how ‘the order in which one usually meets’ paratextual elements would translate to a gallery setting. Anticipating leaflets, gallery guides, and an overarching introduction (likely displayed directly on the wall), we enter the exhibition. Alarmingly, there is a distinct lack of the literature we expected. Do we feel a little lost? A little too light, without those gravitational paratexts to control our readings? A man’s voice drawls from a free-standing speaker; what sounds like a dozen typewriters mechanising emanates from the end of the gallery in disorienting cacophony. Seeking an anchor we look to the first individual work-descriptor we come across: all is as expected. Title of the piece (year); artist’s name; a short description of the artwork at the closest distance. Who holds authorial responsibility for this paratext? Is it the artist of the work, or the curator of the show? The writer or the publisher? Wanting to direct the viewer toward some specific ideological approach, Morris, the curator is likely to have woven his own intentions into the descriptor. On the other hand, while it may be safe to assume that the title carries the artist’s intention, it has, in this setting, had to take on shared ownership, being ‘not materially appended to the text’ or artwork itself. Whoever accepts responsibility for paratextual elements, there is an altered spatial dynamic to paratexts in the gallery setting. Those we are dealing with here have necessarily been transposed from their usual book-bound peritextual placement into the realm of epitexts. That we must navigate space to interact with these works and their liminal devices cannot be ignored. Below, seven plinths support six sculptures, which look like mounds of dust. In a long cabinet before these plinths are six open books – and a prominent space where a seventh would be. Look closely – the text of the pages has been damaged somehow; the print of the letters removed, fragmented. We cannot make out the words, yet the space typically known as the ‘text area’ is still prominent; the margins are still clear. It seems what is proffered here, then, could be ‘read’ as an interrogation of ‘the graphic surface’, a term used by Glyn White in Reading the Graphic Surface for ‘the face of any page of printed text’. ‘Conventionally, perception of the graphic surface is effaced during reading by our interest in the words that compose it’ he states, yet reading, here, is denied us. Studying the page in relation to the novel, White asserts that ‘a minor disruption of the graphic surface can be used to defamiliarise text productively’, thus heightening the reader’s interaction with linguistic meaning. In our case, however, we are led into a closer relationship with the peritextual elements of the page rather than any narrative. As Craig Dworkin observes, ‘[e]rasures obliterate, but they also reveal; omissions within a system permit other elements to appear all the more clearly’: note the unspoilt print of the page numbers; there are the titles, running ‘along the tops of all the pages’ as Genette would have us used to. But – wait, they are in French: ‘Á la Recherche du temps perdu‘; we recognise Proust, but who is responsible for his titles’ presentation here? Who erased these words? ‘Jérémie Bennequin: Albertine Disparue, 2016′. The work-descriptor also outlines the process which produced this set of books: Bennequin, with an ink eraser, decimating one page a day for a period of ten years. Suddenly the work is more than just object: it embodies time. We imagine the new protagonist (Bennequin) subverting the narrative’s title, actively seeking to lose time, day out, day out. These imaginings, though, do not fall within Genette’s definitions of the paratextual. In the bookcase, we notice that it is Albertine that is missing, and the corresponding plinth that stands empty. ‘One volume of Proust’s work has been purchased by a Swiss art collector’, the wall-descriptor boasts. As such a specific detail to give us, Morris invites our reading of the piece to draw in a level of serious investment in contemporary art, mixed with the knowledge that Switzerland is awash with blue-chip galleries. Our curator has explicitly directed us away from the work, beyond even the museum, towards connotation. Yet, like imaginings, connotation is not linguistic, and hence, not paratextual. For Jerome McGann, Genette’s dismissal of all things non-linguistic limits the theory of paratexts. He calls ‘the distinction, text/paratext […] not strong enough’, and in his own theory posits ‘the text as a laced network’ rather than hierarchy. For him, then, context is everything, and a text is ‘a material event or set of events, a point in time (or a moment in space) where certain communicative interchanges are being practiced’. In foregrounding the social-historical-political contexts of works, the nationality of the buyer of Albertine is validated to contextualise our reading of this work. The absences of those two empty spaces are not void, but bear the fullness of association: the elite art-buying world, the power of money and the private ownership of art-objects removing any possibility of public viewing. Subsequently we learn that the inclusion of this detail was a mistake, that Morris had intended to (and eventually did) remove all information about this sale from the exhibition catalogue at the request of the artist. ‘I had forgotten I had left the detail of the collector’s country of origin on the information panel, all of which I did write and am responsible for’, he reveals in response to our curious email. If, however, Morris is ‘responsible’ for this paratextual slip-up, whose intention does it reveal now? Approaching from Genette’s stance, the desired authorial intention is impossible to find, leaving us wondering whether we should accept this detail’s paratextual influence or not. This feeling of floating somewhat adrift might well be due to Genette’s ‘assumption about the location (and the locatability) of literary authority’ (as McGann would have it), which has built in us a desire to find something which perhaps was never there. For McGann, ‘[a]uthority is a social nexus, not a personal possession’ and its location ‘necessarily becomes dispersed beyond the author’. Note that it is dispersed beyond the author, but McGann is careful not to deny authorial intention as a source of meaning altogether. He does not, for example, go quite so far as Barthes famously did in killing the author and asserting that ‘a text’s unity lies not in its origin but in its destination’. McGann’s aim is a reconfiguration of the elements we place importance on when dealing with texts, drawing heavily on cultural contexts of both production and reception. In developing this approach, McGann has called for more of a ‘radial reading’, drawing on many sources not explicitly presented to the viewer. ‘It necessitates some kind of abstraction from what appears most immediately’, yet it may be useful here to concretise this somewhat, through the plethora of paratextual apparatus surrounding Albertine. A film documents Bennequin erasing one page which, for an hour and twenty minutes, forces the strenuous, hypnotic rasping of the activity into our ears. There are the sculptures, and also a ‘how-to’ manual detailing the process of ‘blending’ the printed page. Manual is unquestionably tongue-in-cheek, bringing in a playfulness we had not before observed. The wall-descriptor gathers these distinct works not under the title, Albertine Disparue, but ‘the complete work Erased Proust Writing (2005-15)’. In turning to the exhibition catalogue, a third title, ommage Á la Recherche du temps perdu, makes itself apparent. The pun on homage is clear here, the erasure of the ‘h’ indicative of the erasure of the text; the French pun on ‘gommage’=’erasure’, however, is likely lost to the purely English speaker, and the subtleties and playfulness of this ‘mixed title’ in Genette’s terms somewhat lost on the viewer. In fact, the whole title itself (ommage) is very likely lost on the majority of viewers, being secreted in the (rather pricey) exhibition catalogue. As Genette points out, often are paratexts ‘addressed only to certain readers’, and it is thanks only to our commitment to curiosity that we learnt of these details. ‘Thanks’, because when viewed through each of the titles, Bennequin’s work begins to ‘generate different networks of meaning’, in McGann’s sense, which we read back into our understandings of the work. Within the catalogue there are further titles still, in subtitles for the books of la Recherche themselves: Tom(b)es (tomes/tombs), and separately for the sculptures: Mo(n)ts (words/mountains). These subtitles feed the empty spaces once occupied by Albertine, their bracketed letters highlighting both possibilities of absence and inclusion. The brief description which follows the latter adds traction to our previous imaginings: ‘Shavings of rubber & ink. Ashes of time lost’. Can it still hold true that those thoughts don’t operate within the bounds of paratext? Don’t they ‘ensure for the text a destiny consistent with the author’s purpose’, as Genette would demand? The multi-layered physical erasures and the network of supporting, often elusive, apparatus around Tom(b)es overarchingly present ‘an absence of information that calls on the reader to synthesise other information’, fulfilling White’s description exactingly. As we have seen, what McGann describes happens almost explicitly here: ‘a great deal of important reading goes on which will not involve any direct encounter with the so-called text itself’. Our dialogue with this work occurs not between the covers of, for example, Du côté de chez Swann, but in realms which even Genette’s epitexts don’t reach. Bennequin has rocked the ground beneath Genette’s hierarchical structure, and the substance of the idea, the art, now occurs mostly in those peripheral fringes: within the paratext itself. At the other end of the gallery the cacophonous clacking has not ceased. Turning our attention toward the sound we see seven large, white-glow LCD screens mounted in a row. Approaching, we see that each screen carries a text which continually types itself up – that nostalgic ‘ping’ rings out at irregular intervals as each invisible typewriter reaches its margin. ‘Kenneth Goldsmith: Seven American Deaths and Disasters, 2013′ the wall descriptor states, elucidating Goldsmith’s appropriation of the reportage of ‘seven pivotal moments in recent American history’ as prose poems. It is not purely the sound that beckons the typewriter: the pop-cult serif that is Courier is unmistakable. Surprisingly, an identification of this sort is something Genette demands more of within publisher’s paratext: ‘[t]he reader has the right and sometimes even the duty […] to know the typeface’. Certainly, in this instance, we couldn’t agree more. Who would deny that Courier is inseparable from the notion of the typewriter? We cannot dissociate the two, and the social-historical-political contexts of the typewriter that McGann would foreground are precisely what are being called upon here. This machine was pivotal in altering the production of both art and literary texts; think: Warhol, Kerouac, André. In Vilém Flusser’s opinion, ‘if we look at the typewriter, we can see materially, to some extend [sic] how one aspect of our mind works’: that the gesture of writing-thinking, is a linear, directional one. As Kaja Marczewska writes, by drawing attention ‘to the physical condition of the process of textual production itself’, Seven American Deaths implicitly alludes to the history of, and all commentaries on, the typewriter. And, as Flusser believes, such commentaries can offer opportunities to examine our very humanity. Having tantalisingly alluded to the possibility of breaking the chains on his definitions of the paratextual, Genette, instead, backtracks: ‘paper is obviously less relevant’ than font – only a material hurdle to be crossed in order to get a linguistic message out into the world. In his hierarchy the material vessel, Goldsmith’s screens, are bottom. Yet it seems obvious that these choices are not ‘indirect commentary on the text’, they are the text. In McGann’s words, ‘the physique of the “document” has been forced to play an aesthetic function, has been made part of the “literary work”‘. Seven American Deaths almost demands us to approach it through McGann’s theory of textual networks, which is shown in the way the piece ‘sets up a reading field and a set of interpretive possibilities’. Taken together, the sound, action and material (both font and screen) amount to more than commentary on the linguistic message they present, but to a social and historical commentary. The convergence of the outdated and the up-to-date; the continuous typing and re-presenting of old news builds to echo Jameson’s view from the early 80s: that ‘the very function of the news media is to relegate such recent historical experiences as rapidly as possible into the past’. This is equally applicable to our methods and technologies for both reading and writing: what’s current will always (soon) be superseded as we move ‘towards a culture based on the screen rather than paper’, as Karin Littau sees it. It would be fair to state that none of these observations would be valid, if it were only the ‘text as such’ at the heart of the matter. As we saw earlier with Bennequin’s Erased Proust Writing, it would perhaps be pertinent to say of Seven American Deaths that it’s ‘message’ is clearest within the paratextual abstractions gathered around it. Goldsmith would be the first to repeat his famous saying: ‘[y]ou really don’t need to read my books to get the idea of what they’re like; you just need to know the general concept’. That’s not to say, however, that the surrounding dialogue could possibly exist without the body of text that makes up the work. It is true that, as Genette points out, ‘paratexts without texts do exist’, but here he refers to specific linguistic fragments, not the ideological, dialogic network we are conceiving of. Still, it is a text; no matter how far we travel through connotation, ‘all texts, like all other things human, are embodied phenomena, and the body of the text is not exclusively linguistic’, McGann reminds us. The necessarily physical existence of text is itself, perhaps, the vestibule we must enter into in order to access ideological meaning. In the gallery, remember, we must navigate space, walking our fleshy bodies from piece to piece. The publishing house run by Morris (along with others), which has published much of Goldsmith’s work, is itself called ‘information as material’, a ‘purely factual’ piece of paratext that does indeed colour the way we see this work. ‘information as material’ is the primary driver for the existence of this text as an artwork. The original incarnation of these words was audio-visual, Goldsmith simply transcribed what he heard on the radio or television. In fact, we learn from the catalogue, Seven American Deaths was originally published as a book of prose poems. ‘For this exhibition, I invited the creative technologist Ian Truelove to create [the] algorithm’ that keeps the texts retyping themselves. This ‘I’, however, is not Goldsmith, but Morris; the piece is an appropriation of an appropriation, and Genette’s desire to pin down authorial intention is again dispersed – this time between three artists, plus news-reader and, at the root, fate. In its existence as a book, the events reproduced by Goldsmith appear in a necessarily linear format, as is shown from the contents page. Yet, unlike in the gallery, the reader has control over where to begin in this book, where to jump back to, what to linger over. Goldsmith’s appropriation of these news items immortalises them, preserving them in static book-form, forever. Morris, on the other hand, uses the notions of the news and mechanical and digital production to create a perverse continuum of the same events. For example, in book format Goldsmith makes use of various punctuational devices such as line breaks, paragraphing, italics and dashes whereas Morris discards most of these, dashes being replaced by ellipses. On-screen, writing solidly fills the whole text area, letters appearing in consistent rhythm, ellipses facilitating that continuity: that clack-clack-clack of the hurtling on of time, new news and fate. The collaboration that is Seven American Deaths and Disasters in Reading as Art works to ‘exploit the malleability of digitised text, and show how its significance can change when rapidly shifted from one context to another’. This message – of mutability, of change – is undeniably separate from the actual linguistic substance of the news coverage displayed, and shows that no matter how a text is physically extant, that physicality cannot be overlooked. We take a step back and cast our gaze once more around the gallery. How would our experience have played out here, had we rigidly confined ourselves to Genette’s definitions of the paratextual? Our visions of Bennequin losing time; the socio-historical commentary around the typewriter; considerations of the future; the physical embodiment of texts – none of these things could have played roles in our interactions with these art-objects. We would be left with the linguistic substance of the works themselves which, as we have realised, is not always where the most fruitful dialogue occurs. Indeed there are avenues we have not followed during our brief visit to Bury Art Museum, to do so would require a much lengthier piece than this. Authorial intention could (perhaps should) have been followed right back to its roots: Proust on the one hand, fate on the other (which would necessitate a whole new chapter, if not book, in itself). Texts as human phenomena is another route we had not the time to explore as fully as we would like. And, while we have dabbled in the fringes of reader response theory, we have been careful not to draw too entirely on our own subjectivity in these instances. Admittedly, we have strayed far from Genette’s object of study: literary texts within books, and have turned to artworks that merely work with text rather than through text. Yet what we have learnt is that Genette’s Paratexts laid the groundwork for a different kind of thinking; he diverted interrogation towards elements that are always present, yet rarely considered in an analytical manner. What his theory called out for, however, was extrapolation. Where McGann took textual theory one step further, embracing the ideological, we perhaps have stepped aside from his position in attempting to bring textual theory into the art world. What is imperative, then, is an openness when approaching both texts and artworks. Genette may shudder if he knew us to do so, but instead of being ‘wary of rashly proclaiming that “all is paratext”’, we must now assume in his stance a breadth of meaning, and take in its widest application the following statement: ‘that, in principle, every context serves as a paratext’. I don’t spend much time in the library or in off-line archives since I work essentially full-time in a non-research capacity but I’d love to do so; every time I use archive materials I have a fantastic experience. Well that’s a common enough feeling — both the joy of reading and the lack of time to do it — but I hope my experience of reading Robert Grenier’s masterpiece Sentences which I’m about to relay, in the archive, specifically in Bury’s Text Art archive, might be of interest to those with an interest in Grenier and also in Bury Art Museum’s important resource. Sentences was published in 1978 and for some, including me, would easily find a position in their top ten things to do before you die list. Certainly it is one of the key works in twentieth century poetry. I wrote this piece on September 11th 2015, immediately after leaving Bury’s Text Art archive. This was the first time I had read Sentences as a thing in the off-line world. Prior to this I’d read the online version at Whalecloth a number of times as well as various critiques. To my knowledge there are no other copies of Sentences in UK libraries; on WorldCat it is listed as being in 6 libraries in the world, all in The United States. Importantly, and famously for those who already know the text, there are no instructions about the order in which the deck of cards should be read. But intuitively you would think there are three things that could happen — they could be kept in order, shuffled or put into sets by content or linguistic device. Amongst others Michael Waltuch, publisher of Sentences, and Ron Silliman have written about this. Grenier also says as much in his interviews at PENNsound with Charles Bernstein and Stephen Ratcliffe. I don’t want to go into individual poems so much here as to explain the joy of reading Sentences as archived material, in the archive, and the processes of reading the poems in accordance with the way Sentences is catalogued. The copy of Sentences at Bury, “The Bury Sentences” as I now call it, is a like a “bootleg” record — just as cool as the original but with minor differences to interest the aficionado. I’ll explain why. As I’ve already mentioned, when you buy a copy of Sentences the published cards are housed in the index box. Well at Bury the box is empty. It is the first of 26 items which comprise Sentences. The researcher may only see these items one at a time, perhaps to deter thievery. So the box. I saw it. I saw its catalogue number. I photographed it. Then I returned it to begin reading the poems. Therefore at no point did I have access to the index box and the poems at the same time, meaning that I was not withdrawing the cards from the box. Instead I read batches of 20 index cards, wrapped in tissue paper. These tissue paper packets, like “top secret” files, are contained in airtight plastic bags. And on the front of these is a white rectangular sticker which says “2 of 26”, “3 of 26” and so on. As I read through I came across familiar faces, classics to me: “sun setting stands forth in greater relief opposite peaks” BUYGM:1533.36, as discussed by Barrett Watten in Total Syntax, “JOE/JOE” BUYGM:1533.160, as appropriated by Tim Atkins in his if p then q collection 1000 Sonnets, “we had bottles of Canadian beer” BUYGM:1533.53, as used by me in a lecture to exemplify modular units in minimalism, and “kept on going to the corner store” BUYGM:1533.12, as deliberated by Grenier and Ratcliffe in their conversations available at PENNsound. But, and here’s the joy and the bane of my library experiences, there are cut-off times, I only had between 10am-1pm to read it as I had to get back home to pick up the kids. So by pack “8 of 26” it was 12.30pm. And here’s a thing I knew from the start, from speaking with the incredibly helpful archivists, the title pages in Sentences were catalogued last: when Bury received the thing the title page cards were at the bottom of the pile so they classified them as such. There is a single card for copyright, another for description of composition/font/cardstock/edition and one which is the title page, along with 3 blank cards (making 6 non-poem cards). As I needed to read these cards before I left I switched from pack 8 to pack 26. Pack 26 contained 5 of the title cards, all but the title page. Pedantry? Perhaps. Yet curiously I now have read and also have not read Sentences. 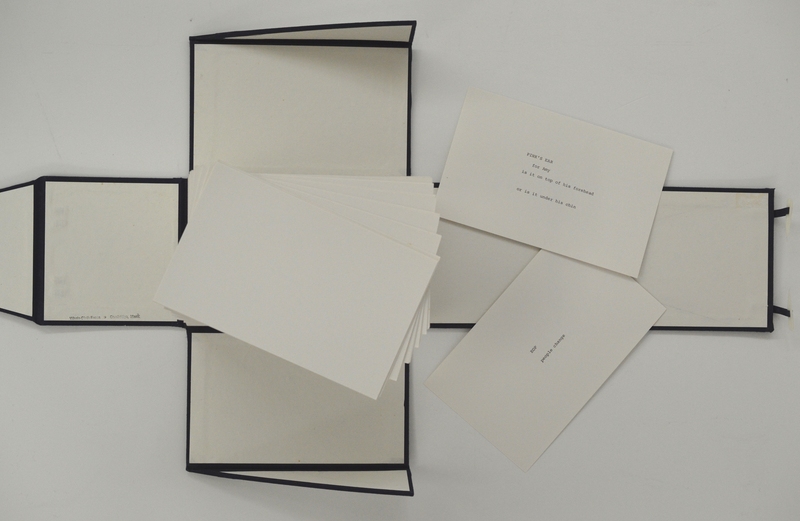 There are either 19 poems in pack 25, to make 20 with the title page, or 20 poems and the title page meaning that this pack has an uneven distribution. If the former is the case then there are an uneven amount of poems in the whole copy. This only occurred to me after I left.